And this, “While Winogrand’s street pictures might appear to be bounty from the hull of a trawler with a Fifth Avenue driftnet. . .” Superb. Very nice essay, thanks for that. “he outran his own workflow (…) It’s in this spirit that I sometimes consider Winogrand to be the first digital photographer”. Yes, that could be true. Though one can argue that he outran his own worflow consciously and voluntarily though (i.e. by postponing film processing months after). 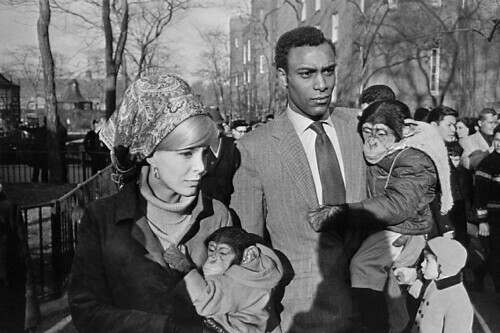 Don’t you think that Winogrand’s work routine was a bit paradoxical, being such a compulsive shooter, wanting to see “how things look like photographed” and at the same time delaying to see the result that long, to the extent that he left about 300k frames he would never see ?! 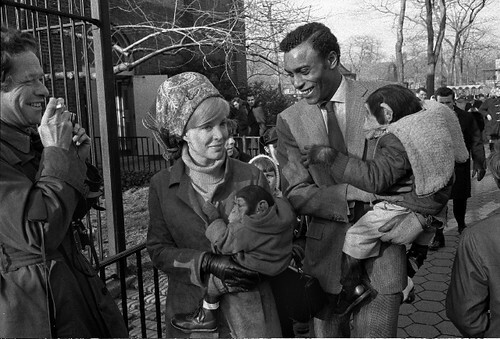 I have always loved this shot of Winogrand’s (but there are many I do) and so it is telling to see another viewpoiint with the photographer captured…WITH the subjects. That also shows how much his particular point of view added to the image ~~~> everything! I believe that toward the end of his life, it was the act of shooting that became important, not the product. But of course, this has been mentioned elsewhere by others. Good article, but: Just so the young and impressionable set doesn’t get the wrong impression, GW, at least in his ‘mainstream’ years, didn’t print his own stuff. He farmed it out. Previous Previous post: Does Haiti’s Crisis Call for a New Photojournalism?